You want the perfect dog. For us, that means no dog hair in our house. Labradoodles are soft-coated with little or no shedding. You want a dog that fits your lifestyle. For us that means a dog that can go anywhere and be good with people, especially children. Not to mention smart, and friendly. We wanted it all — a modern, urban dog. After three years of research the Australian Labradoodle checked all the boxes. It may sound like a silly name, but the more we looked at them, the more we realized that Labradoodles are the perfect dog. With low or non-shedding coats, they have adorable puppy faces, pleasing personalities, and come in three sizes that fit any household. We wanted a dog that was big enough to be athletic, but small enough to pick up. We chose the medium size that ranges from about 25 – 40lbs. 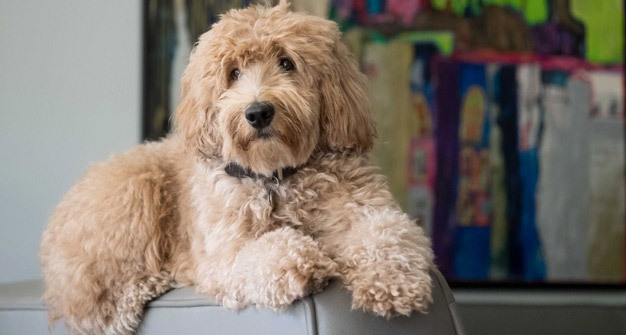 Labradoodles have a certain look that makes them easy to fall in love with. After learning about the breed through the Australian Labradoodle Association of America and talking with reputable breeders, we realized the look we liked was the breed standard. Understanding that a “hybrid” dog will take time to be recognized as a breed, we still wanted to ensure we were following the breed standard. We chose to be members of the Australian Labradoodle Association of America which is dedicated to ensuring sound breeding practices to protect the welfare of the Australian Labradoodle with its strong code of ethics that requires a high level of health screening. Knowing that a first-rate breeding program starts with excellent breeding stock, we chose to work with Gail from Prairie Doodles –a reputable breeder, and our mentor. Since bringing our first puppy home from Prairie Doodles, our dogs have fit perfectly into our family, and our work office. They are people dogs, who want to be with you and interact with you. We live in central Edmonton, which is why we wanted an urban dog. We are active in city-life and our dogs are fully integrated into our home and work, which means they go to work with us. We previously bred golden retrievers (a program started nearly 25 years ago) that we paused for a number of years to take on other pursuits. Golden retrievers, and Labrador retrievers, for that matter, still hold a special place for us. 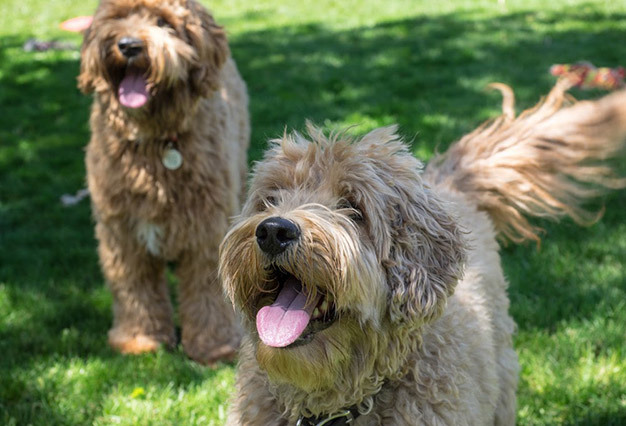 We often turn and look when one is walking by, but now Labradoodles have captured our hearts. With the human kids launched (5 of them! ), we’re back raising dogs. We often refer to our Labradoodles as our ‘children of fur,’ because they are such an important part of our family. Currently, we are keeping our breeding program small so we can focus on building good foundational lines. We learned a lot about all the new methods of health testing that are required because we are committed to upholding the breed standard. Like their Poodle and Labrador predecessors, Labradoodles will one day be recognized as a breed with national canine associations. In the meantime, Modern Doodles is committed to upholding the standards of the Australian Labradoodle Association of America, which, by the way, requires higher testing standards than most pure-breed associations. Our puppies are hand-whelped and home-raised. Our adult girls are house-dogs who go everywhere with us, provided they are allowed to be there and it’s a safe environment for them. We choose to find suitable studs that are owned by other reputable breeders, rather than having the boys live with us. Over time we will carefully select approved forever homes for our retired girls and guardian homes for some up and coming breeding stock. If you would like to know more about either program, please contact us.